Celebrity Chef Maneet Chauhan made Shredded Duck Vindaloo on Dhokla Corn Bread and Mango Slaw. 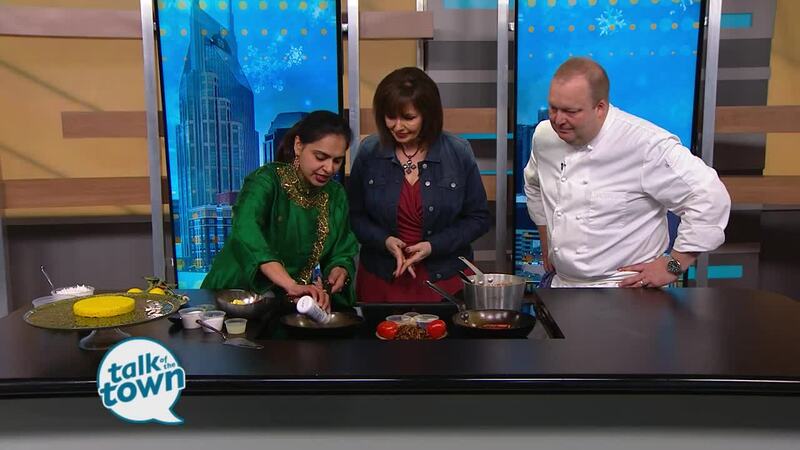 (see recipe below) Join renowned Nashville Chefs Andy Little of Josephine and Chef Maneet Chauhan of Chauhan Ale & Masala House, Tànsuŏ, The Mockingbird and Chaatable for a special dinner in support of Second Harvest Food Bank Middle Tennessee. The event is Sunday, January 20 at 7pm at Josephine, located at 2316 12th Avenue South, Nashville, TN 37204. Get more information and reserve tickets here: https://www.eventbrite.com/e/chefs-maneet-chauhan-and-andy-little-live-at-josephine-tickets-54554285336 . Fry and brown onions, blend all ingredients. Marinate duck legs in it. Season duck leg with salt and pepper. Heat a pot to smoking point. Sear all duck legs, pour the marinade over it and add some water, braise till it shreds. Shred and keep aside. Cut the mango in julienne strips, add the rest of the ingredients. In a big bowl add besan, sooji, hing, salt and sugar. De-seed green chilies. Using a motor pestle pound chilies and ginger to a fine paste. Add oil, citric acid, freshly grounded green chili and ginger paste and salt. Add water and mix until well blended. Beat the dhokla batter couple of times to incorporate air into it. Add Eno and whisk until it is well blended. The batter will become airy and frothy. Grease a pan in which Khaman will be steamed. Pan should almost be double in size as the batter will rise up while steaming. In a large vessel fill water and lay a strainer at the base. Pour batter in that greased pan and place it inside the vessel containing hot boiling water and over the strainer. Khaman is cooked and all puffed up. Insert a toothpick to check if khaman is properly cooked. It should come out clean. Allow it to cool down for 30 minutes. Insert a knife around the edges to loosen up Khaman. Flip it over onto a plate. Using a sharp knife cut Khaman into desired pieces. In a pan heat oil, add mustard seeds, when it starts to splutter add curry leaves and green chilies and let it splutter on a low flame. Add cilantro and lemon juice with a touch of salt. Remove from flame. Add sugar and water. Mix it well. Pour this hot mixture over steamed Khaman.